Sometimes, it is difficult to get someone who has bipolar disorder to take their medications. There are several reasons for this. The important thing, however, is to learn how to help them take their bipolar medications. The best way to treat bipolar disorder at this time is through medication and therapy. The key is knowing which bipolar medications will work for you. There is still no medical cure for bipolar disorder; therefore, people with the disorder have been forced to look elsewhere for a cure. The Internet has gladly stepped forward as a ready source for miracle (natural) cures for bipolar disorder. I'm not saying that some of these cures do or do not help; all I'm saying is to remember the saying, "If something sounds too good to be true, it probably is." If there were one magic pill to cure bipolar disorder, everyone with the disorder would already be taking it; however, no such pill exists, so we must depend on other bipolar disorder medications to at least alleviate the most common symptoms of the disorder. 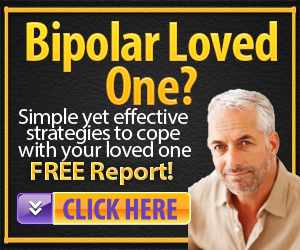 There are many natural bipolar remedies being sold today that claim to cure bipolar disorder. However, if you look at these advertisements more closely, usually you will find that they are trying to get you to replace your medications with their "supplements" or "herbal remedies," which are in the form of pills. Many people with bipolar disorder already feel as if they are taking too many pills, and are turned off by these offers, yet don't know what to do. Therefore, I am going to discuss true natural bipolar remedies not using pills, which will still help you with your bipolar disorder. For most people who have bipolar disorder, a traditional form of therapy – such as Cognitive Behavioral Therapy, or Psychotherapy ("Talk Therapy") – is suggested as part of their treatment. However, there are other alternate therapies that may also be effective for them in addition to their traditional therapy. What Should I Do When My Loved One Gets Sick? Bipolar disorder comes with its own signs and symptoms and, if you have researched it, you will know what to look for in your loved one to tell if they are getting sick or not. But what should you do when your loved one does get sick? Bipolar disorder is a lifelong, incurable disease. However, it is a treatable one. The main treatment consists of medication and therapy. But what can you do if your loved one refuses to take their medication? There are several medications for bipolar disorder; therefore, to list them all in one article would be overwhelming. Therefore, a listing of the types of bipolar medications would be more in order, and you can see under which classification your particular medication falls. At least you will have a better understanding of what your medication for bipolar disorder is supposed to do and how it is supposed to function.